We aim to keep your smile healthy for years to come. At Aevitas Dentistry, our goal is to assist each patient in attaining a level of oral wellness that only requires six-month check-ups at our clinic. Newmarket families know that we keep their best interest in mind – including what you need from your smile today, tomorrow, and ten years from now. 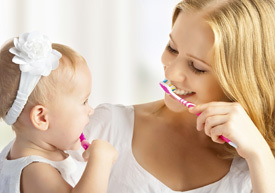 Our hygienists works closely with each patient to establish an oral hygiene routine that keeps teeth and gums free of decay and periodontal disease. With a dedicated care plan, you can prevent new decay from causing cracked, fractured teeth and fillings years from now. We recommend a preventive clean every six months to keep your smile brighter and healthy for as long as possible. A bacterial analysis of your mouth will determine the level of cavity-causing acids that are present, which can pinpoint your risk level for tooth decay. During your check-up, we will thoroughly assess the integrity of your existing restorations. If something suspicious is noted, we will share an image of the area with one of our high definition intraoral cameras. That way you can see the same thing that we do. For instance, if an old, large metal filling is beginning to leak, we will show you the margin that is allowing bacteria to creep in underneath. Restorations such as this should be replaced fairly quickly, before they have a chance to fracture. Looking for a dentist that won’t push you to have treatment you don’t want or need? Our dentists provide a variety of dental treatments to help you keep your smile’s health on track. If you’re due for a check-up and clean, contact us today to schedule a visit at our Newmarket clinic.